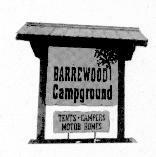 When we left off last time, we were at Barrewood Campground in Westfield, VT. We stayed there for longer than planned (16 days). It rained a lot so we had a few non-hiking days. The day we were going to leave it rained all night the night before. That morning we packed-up and left in the rain. When we got approx. 1 mile down the road, the road was blocked. A State Highway worker said that the road ahead was under 5' of water. When we asked about going the other way, he said it was also closed. We returned to the campground and spent another night. The lower end of the campground was flooded. We almost had a "lakefront" site. The next day the roads were back to normal and we could leave. This is Smugglers' Notch just North of Mt. Mansfield. It's all uphill from here!! If you're wondering who took the picture, well there's a toll road that smart people can take. It costs $15 but it's a lot less work. This is the visitor center at the top of Mt. Mansfield. It's the highest mountain in Vermont. There are actually several "peaks" on this mountain. It's said to look like the profile of someone lying down, so there's a brow, nose, lips, chin and an Adam's apple. That's the nose behind the visitor's center. This is a picture of Judy hiking toward the lips and chin. She didn't like the chin. To go from the chin to the neck you must climb down ledges over a cliff. But it's all down hill from there. The chin is the high point toward the left. The trail goes down the hill towards the right. That's a restaurant at the left at the top of the ski runs. There's a gondola that brings the skiers up the center. It was closed when we were there but opens later in the summer for lunch. You can barely see some white spots on the mountain above the restaurant. 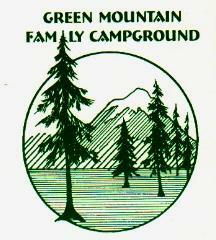 We've now moved to Green Mountain Campground South of Bristol, VT. It's raining again so we played tourist again. We went to the Lake Champlain Maritime Museum. They have displays of the maritime history of Lake Champlain. A large area is the Revolutionary War. This is a model of the "Philadelphia", one of Benedict Arnold's ships that was sunk during his campaign that delayed the British in 1776. They have built a full size replica which is docked at the museum. As you can see it's still raining. The crewman who was manning the ship gave us a 15 minute version of the history of the Revolutionary War. We didn't know that Benedict Arnold was one of the great heros of the war until he became disillusioned toward the end of the war. Who knows -- If he hadn't switched sides we may have had a "President Arnold". They give classes in boat and shipbuilding and have a resident model maker. They were preparing for a class that was starting where you build your own Kayak and then learn to paddle it. Sounds like fun. We had lunch in a town called Vergennes, Vt. Most of the towns in the area seem to have started where they had water power for their industries. This is a picture taken below the falls in the center of town. As you can see, we visited the Vermont Teddy Bear Factory. They make over 500,000 bears per year. They specialize it "bear-grams". You call them and they will customize and ship a bear to someone for you. They come with every imaginable costume. A fully dressed bear is about $80. Some business! !